The fish in the river are safe today, because one heck of a fisherman got called away. The fish in heaven had better beware, because he’ll be fishin for them up there! 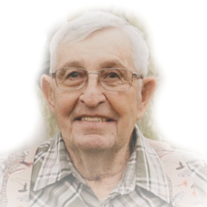 Marcus Wade Thain, 80, passed away on February 4, 2019 at home surrounded by his family.Wade was born April 2, 1938 to George and Ann Lemon Thain. He grew up on the Thain Dairy Farm in the beautiful fields of Benson Utah, where he learned to work and play hard. Wade was an avid fisherman, hunter and outdoors-man, he learned to navigate the Bear River while trapping muskrats, and he knew every bend of the river. Wade made friends where ever he went. He would help anyone, anywhere, anytime. If he didn’t have what you needed on his belt or in his pocket he would find it in his truck. He truly lived by the Boy Scout Motto to be prepared! Wade graduated from North Cache High School where he lettered in wrestling his Junior and Senior years. Wade served in the U.S. Army from 1956-57, following his military service he returned to Cache Valley. He drove truck for Cache Valley Dairy and was a heavy equipment operator for Parsons Construction, Legrand Johnson Construction and Nucor Steel, he then worked at Shrieber Foods until retiring. Wade made many friends through his working years and cherished these friendships. Wade married Coy Anderson, they had three daughters, Cindy, Janet, and Charlotte. They later divorced. In 1973, he married Elizabeth Heaps and became dad to her three children, Shirley, William (Bill) and Michael. Many fond memories have been made in 46 years, hunting, fishing, camping, old dogs, old jeeps, and old motorcycles… if Wade could fix it, we had it. Grandpa Wade sat through many soccer, baseball, football and basketball games, as well as, musicals, dance recitals, and horse shows. He enjoyed watching the kids do what they loved. Wade was an active member of the Church of Jesus Christ of Latter Day Saints. Wade is Survived by his wife of 46 years, Elizabeth Thain, a sister, Coy (Fred) Luedtke, two sons, William (Deon) Heaps, Michael (Angie) Heaps and three daughters, Shirley (Robert) Whitman, Janet (Troy) Matherne and Charlotte Thain. 13 grandchildren, and 9 great grandchildren. He was preceded in death by his parents, George and Ann Lemon Thain, a daughter, Cindy White, his brothers, Melvin Thain, George Thain, and sisters, Jeaneen Thain Duffy, and Gloria Thain Reese. A viewing will be held Tuesday, February 12, 2019 from 6:00 to 8:00p.m. at Allen Mortuary, 420 East 1800 North in North Logan, Utah. Funeral services will be held Wednesday, February 13th at 12 noon at the Smithfield South Stake Center, 451 South 250 East Smithfield, Utah. Friends may call at the church from 10:00 to 11:30a.m. prior to services. Interment will be in the Logan City Cemetery.